Driving from the airport to the hotel it struck me how much I’d missed older style buildings and character. Houston has some good points, but I instantly felt at home in San Francisco, mainly due to the buildings. Our room wasn’t ready when we arrived at the hotel so we took the essentials and headed out for an explore. Fortunately the hotel is at the top of the hill and so wherever we wander is downhill in all directions. 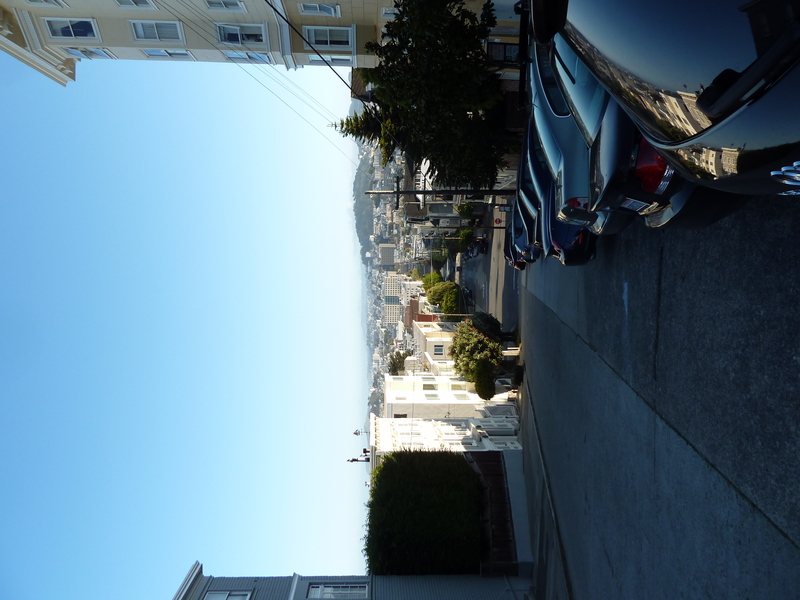 And the hills here are very big – so much so that on some streets there are restrictions on how you can park (perpendicular to the hill only). First stop was an amazing playground just around the corner, so the girls could build up an appetite and then down into the city for lunch at the Woodhouse Fish Co. The seafood here is amazing and I had delicious crab cakes and lots of local, very refreshing, Californian wine (made in a winery called Frog’s Leap). Then we had to wander back up the hill to the hotel. Which would have been fine had it not been for the children (particularly the Little One) struggling with the big hills. In the evening we got a taxi down to Fisherman’s Wharf (much easier than carrying the tired children the couple of miles into town!) We had a quick trip to the beach (where the children decided they didn’t like sand between their toes!) and then along to the wharf itself to see lots of fresh fish and crabs (which upset the sensitive nose of the Big One), before having some delicious soup (once the sun went to bed it got cold quickly and the wind is a constant here) in a bakery on the front. We just had time to pay a quick visit to the Ghirardelli chocolate shop for some hot chocolate before getting a taxi back up the hill to bed. I love the Ghiradelli chocolate shop! I hope you have a great time! It was great but very difficult stopping the girls from picking up everything to buy!